Given the rationale they have embraced, is there any reason to believe this will happen, or that it will matter if it does? “For the better part of four years, progressive media has had President Barack Obama’s back. “Now that he’s won re-election, it is faced with a choice: Should the left continue always to play the loyal attack dog against the GOP, blaming the opposition at all hours of the news cycle for intransigence? Or, should it redirect some of that energy on the president, holding him to his promises and encouraging him to be a more outspoken champion of liberal causes? “Already, there are rumblings of change. 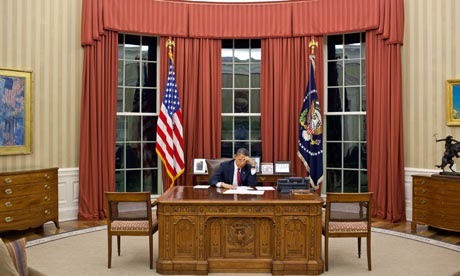 “In the days and weeks following Obama’s victory, progressive voices, primarily in print media, have made efforts to push the president on key parts of the unfinished liberal agenda – including climate change, drone strikes, troop withdrawal from Afghanistan, the closing of the detention facility at Guantanamo Bay, civil liberties and gun control. . . .
As for the vow that media progressives will now criticize Obama more and hold him more accountable, permit me to say that I simply do not believe this will happen. This is not because I think those who are taking this vow are being dishonest – they may very well have convinced themselves that they mean it – but because the rationalization they have explicitly adopted and vigorously advocated precludes any change in behavior. Over the past four years, they have justified their supine, obsequious posture toward the nation’s most powerful political official by appealing to the imperatives of electoral politics: namely, it’s vital to support rather than undermine Obama so as to not help Republicans win elections. Why won’t that same mindset operate now to suppress criticisms of the Democratic leader? It’s true that Obama himself will no longer run in an election. But any minute now, we’re going to be hearing that the 2014 midterm elections are right around the corner and are of Crucial Significance. Using their reasoning, won’t it be the case that those who devote their efforts to criticizing Obama and “holding accountable” the Democrats will be effectively helping the Republicans win that election? Won’t Obama critics stand accused of trying to keep the Speaker’s gavel in the hands of the Tea Party rather than returning it to Nancy Pelosi, or of trying to hand Senate control over to Mitch McConnell (or, soon enough, of trying to give the White House to Marco Rubio instead of Hillary Clinton)? Once one decides in the name of electoral expediency to abdicate their primary duty as a citizen and especially as a journalist – namely, to hold accountable those who wield the greatest political power – then this becomes a permanent abdication. That’s because US politics is essentially one permanent, never-ending election. The 2012 votes were barely counted before the political media began chattering about 2016, and MSNBC is already – as one of its prime time hosts put it – “gearing up” for the 2014 midterm. I’ve described before how the permanent election cycle is the most potent weapon for keeping the citizenry (and media) distracted by reality-TV-show-type trivialities and horse-race excitement in lieu of focus on what the government is actually doing. But the other significant benefit of having all political disputes viewed through a partisan electoral prism is that it keeps partisans focused only on the evils of the other party and steadfastly loyal to their own. The desire to influence election outcomes in favor of one’s own party subsumes any sense that political officials from one’s own party should be checked in how they exercise their power. If sustained criticisms of the president should have been suppressed in deference to the 2012 election, then I simply don’t see why the same mindset won’t apply to the 2014 and 2016 elections. But let’s assume for the sake of argument that I’m wrong here, and that the “progressive media” really is gearing up to change behavior and unleash a torrent of demands and criticisms aimed at Obama. Here’s my primary question about that: why would that matter? Once you vow unconditional, permanent loyalty to a politician and a party – once you demonstrate that you will support them no matter what they do – why would you possibly expect that they will do anything but ignore you? A rational politician, by definition, pays attention to those whose support is conditional and uncertain, not to those who loudly proclaim that it is a solemn duty to support that politician and his party under all circumstances. That’s just the basic rules governing how power works, of negotiations and politics: those who eagerly renounce all their leverage make themselves inconsequential and impotent. I’d really appreciate it if you did X, Y and Z, and strongly believe you should, but even if you don’t, you should know that I’m going to be there for you and your party: cheering for you, raising money, demanding that everyone else support you, doing everything in my ability to keep you empowered. Why would anyone believe that posture will affect anything? Once the choice is made to lock oneself into a state of permanent, unbreakable partisan loyalty, based on the lesser-evil justification, then one renders oneself completely powerless. I’m not arguing here against that choice. Whatever one thinks of the lesser-of-two-evils rationale, it’s at least cogent and rational. The debate over that choice has already been hashed out and there’s no point in repeating it here. But whatever one thinks of it, there are costs and benefits to that choice, and one should be honest about both. The benefit, which its proponents endlessly tout, is that it prevents the empowerment of the “greater evil”: the GOP. But there’s a significant cost to that choice that they almost never acknowledge: namely, to announce ahead of time that you will always lend your unlimited support to a particular party no matter what it does is to instruct politicians to ignore you, to disregard all of your beliefs and grievances and efforts to “get tough” and hold them accountable. It should be said that there are other ways to impose genuine accountability besides making one’s electoral support uncertain. One way is to engage in political protest movements outside the electoral process, of the type that forced Lyndon Johnson out of the 1968 race in protest of his Vietnam war, or even the Tea Party protests that put genuine fear in the hearts of political elites. But progressive media figures, for the most part, want nothing to do with street protests. There was, and is, a genuine, powerful movement devoted to protesting the political class on populist grounds – the Occupy movement – and most of them treated it with a mixture of condescension and scorn, largely because they couldn’t figure out how it might help Obama and the Democratic Party win elections. Nobody should hold their breath waiting for Hendrik Hertzberg and other similar progressive media figures to start supporting protest movements against the policies of the Democratic Party which they claim to find so objectionable. Another possibility is waging a battle within the Party against those perpetrating policies to which one objects by, for instance, challenging the Party’s establishment candidates in primaries. That is how the Tea Party was able to force the GOP to pay more heed to their agenda. But establishment progressives regard the Tea Party’s tactic with contempt because it was guilty of the most grievous sin – it undermined the Party’s ability to maximize its electoral success – and would never dream of posing a similar challenge to their own party’s establishment. I know from experience, having worked for several years on a project to recruit and empower primary challenges to awful Democratic incumbents, that any project that might cost the Democrats even a single seat in Congress will be met with anger and recrimination by establishment progressives. So, even if it actually happens, what Hertzberg and company are really talking about with their tough-talking vows to “be tougher” on Obama are empty gestures. “Demands” of politicians unaccompanied by a strategy to wield power are inherently inconsequential. There are truly few things I’d like to see more than progressives holding Obama accountable and trying to compel him to change behavior, but their past conduct – and especially the reasoning they offered to justify it – leaves little reason to believe that this can or will happen. Doing that requires a radical change in how one thinks about political priorities and, even more so, one’s own functions and duties as a journalist. Do you see any serious grappling with those questions in the giddy, triumphant, self-congratulatory progressive media? If you think about it, this is actually an extraordinary indictment of these media outlets. What could possibly be worse for a media outlet – even one with acknowledged political leanings – than purposely to suppress and ignore criticisms of the nation’s most powerful political officials in the name of keeping one’s favorite politicians in power? Is this not the same confession, grounded in the same mentality, expressed in that Politico article from many stars of “progressive media”? (2) now that an election is about to happen, I believe, as a citizen and an opinionist, that President Obama and the Democratic Party should win the election because their opponents are worse. But so monomaniacally obsessed were many members of the progressive media that idea (1) was completely ignored and suppressed in favor of idea (2) – not in the days or weeks before the election, but for years. There is never any justification for those who work in media or hold themselves out as journalists – as opposed to, say, those who are party apparatchiks – to refrain from holding the nation’s most powerful political leaders accountable. That is the core function of journalism – and citizenship. I genuinely hope they’re serious and sincere with their vows to change this conduct, but it is very difficult to see how that can happen given the precepts to which they have so steadfastly committed themselves. Regarding the two columns I wrote last week about AP’s depicting of an absurd graph as evidence of Iran’s work toward a nuclear weapon: the AP reporter responsible for that story, George Jahn, has written a new article admitting that “a leaked diagram suggesting that Iran is pursuing a nuclear weapon is scientifically flawed”, but Jahn nonetheless insists that the graph somehow “still supports suspicions that Tehran is trying to build a bomb, especially when combined with other documents that remain secret.” This post says all that needs to be said about that. Meanwhile, the graph, by design, is now being touted by Fox News and John Bolton to scare people about Iran’s supposed nuclear weapons program.